Indians are individuals indigenous to India. Now I suppose that statement is to some degree inadequate, but it was what Christopher Columbus had in mind when he made landfall in what he assumed was the fabled Indies. Of course old Chris was inclined to be influenced by current inaccuracies in scientific investigation, which informed that the circumference of the planet was considerably smaller than present insight has proven incontrovertibly. And he was also influenced by imperialistic impressions about cultural anthropology which today cause folks to hold their noses in disgust. Indeed, he continued until his death to hang onto his misinformed notion that he had reached India, being apparently incapable of admitting his error. And so Columbus incisively declared the indigenous inhabitants of his discovered islands to be Indians. 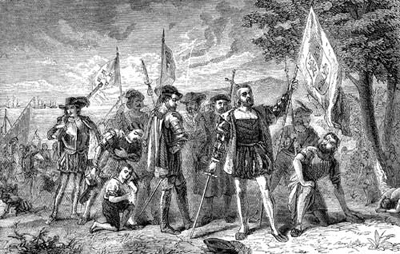 Inevitably, however, it took very little time, even in those days when the information highway was more of a woodland cow trail, for the European explorers to determine that Columbus’ Indies were actually a vast new land mass, separated from India and Europe by two intermediate oceans; and thus the indigenous inhabitants were recognized to definitely not be Indians. However, the initial moniker stuck, although the Admiral of the Ocean Sea’s discovery of a New World (already an Old World to the indigenes who had been there thousands of years, a fact conveniently ignored for centuries by the imperialist invaders) inherited its new name from another less known explorer, Amerigo Vespucci! So goes the intriguing history of name-making. Of course, the American indigenous individuals had numerous names for themselves, according to their many nations, and interestingly, most of those names, varied as they are, mean in their own languages, “the people.” Yet for the invaders… er, explorers and discoverers… all these indigenous groups continued to be labeled Indians, except of course when they indignantly objected to being discovered, and objected to having their lands seized, and objected to having their cultures decimated, and objected to being assimilated into the European imperial melting pot (objections seen as insolent by the discoverers who continued to attempt to inculcate the indigenes with the notion that resistance was futile and that inclusion into the collective was superior to individuality). When the indigenous folk exercised their inalienable indigenous rights and resisted anyway, they were also labeled “savages” for their incivil response. The fact that this moniker has also been widely accepted I have experienced myself, as at my wedding 490 years after Columbus, when the clerk was filling in the legal paperwork, she asked my husband what kind of Indian he was (yes, this was required information for Indians marrying in Canada); and when he calmly stated “savage,” she inadvertently proceeded to enter that piece of information inalterably in triplicate on the official legal form! Of course, over the centuries a number of adjectives, mostly pejorative (as in “drunk” or “wild’), have come to be firmly attached to both terms, “Indian” and “savage,” but all in all, “Indian” continued to be the official moniker for individuals indigenous to America! Nearly five hundred years have passed, and yet another apparent age of enlightenment has finally started to unsettle the accepted misnomer. Alternative labels have been experimented with in between. “Native” was perhaps the first common attempt, but more often than not it was simply attached to the old label, as in “native Indian” which is of course also inaccurate, as a native Indian must in reality be an Indian from India, in which case combining the two terms is simply redundant, as in “Indian Indian!” At any rate, “native” by definition only means being connected to a place by birth, as opposed to “indigenous” which adds the implication of not having been introduced from elsewhere, certainly a more accurate label, but perhaps too difficult to say, and worse yet, inconvenient to spell; and perhaps too close to “ingenuous” which indeed some folks do in ignorance attach to indigenous people, or “indigence” which is related to hardship, poverty and deprivation, which reminds us uncomfortably of certain facts we’d generally rather ignore. Another label, “aboriginal,” has also been tossed around, but it also seems not to have taken hold, perhaps because there is a feeling it belongs to the indigenous peoples of a certain southern hemispheric nation, and the term in relation to that nation has itself taken on connotations related to oppression by a colonial and/or invading culture. So far as I can tell, the current term of favour is “First Nations” which does recognize primacy of inhabitation, and at the same time recognizes that there were, and remain, a wide variety of cultures certainly sufficiently developed to claim nation status in their own right. Unfortunately, the term is rather awkward to use in simple conversation, and perhaps also uncomfortably reminds the majority society of unpleasant historical and political truths which, if corrected at this point, would require some major restructuring of our comfortable view of North American society. Still, despite the present politically correct disparagement of the inappropriate “Indian” label, the term lingers on, inasmuch as North American indigenous inhabitants are still administered (!) under the “Indian Acts” of their respective countries, and legally, on paper, are still referred to as Indians. Indeed, my very white Caucasian face smiles out from a Certificate of Indian Status card which proclaims that, due to my marriage to an “Indian” prior to 1985, I myself am an “Indian within the meaning of the Indian Act, chapter 27, Statutes of Canada (1985).” Oddly enough, at the same time as I was endowed with this special status, my husband’s sister had been stripped of her status, due to her marriage to a non-Indian. True, she was able later, through a mass of paperwork, to regain status for herself, and for their four children. Also oddly enough, our first child, born before our marriage, but even according to her legal birth certificate fathered by a Status Indian, whose last name she carries, had to be “adopted” on paper by her father, after our marriage, in order to receive her status! Ah, the intricacies of the policies of Indian and Northern Affairs Canada! Incidentally, there are moments when it is amusing to be Indian. For example, an Indian can make “Indian jokes” in the presence of non-Indians and laugh uproariously while gleefully watching the non-Indians squirm uncomfortably as they suspect that to incautiously laugh along would incriminate themselves, betraying their deepest prejudices they hide so well beneath their politically correct outer veneer. I experienced the same sort of humour when living in the far north of Canada, where Inuit friends told “Eskimo” jokes in the same vein. Still, I don’t recommend that you non-Indians decide to join in the humour. Be assured it is inappropriate and definitely not funny coming from you and could incur incendiary developments in the process! Oh yes, it must also be considered that there are those other kind of Indians out there – the individuals indigenous to India. At one time, our family lived on a street on which almost all the inhabitants were Indians from India. It turned out to be one of the friendliest neighbourhoods we’ve ever lived in, and we were soon visiting in each other’s homes, sharing our different foods, and discussing our cultural understandings and misunderstandings. Our neighbours informed us that they were “Indians,” not “East Indians,” and my husband informed them that he was an “Indian,” not a “drunk Indian!” They asked my husband about his “relatives” in the area, who happened to be from a totally different First Nation, and he responded by asking them if everyone with the name “Singh” was related. We all laughed, and learned a bit about each other. There was indeed a large Indian population in the larger community (actually two Indian populations, one of each kind), along with a mixture of other hyphenated-Canadians. As my husband does not particularly “look Indian,” whatever that is supposed to mean, he has often been mistaken for Arab, Greek, Indian, and of course, “native” Indian. One day we were in a small hardware store owned by a Chinese-Canadian. An Indian was also shopping there, and there developed a language difficulty between the Chinese-Canadian and the Indian-Canadian. The store owner heard my husband and I speaking English, and, incognizant of my husband’s indigenous Indian-ness, asked him to interpret. “But I’m not that kind of Indian,” my hubby had to explain. Clearly I am rambling, and must bring this apparently inane treatise on Indian-ness to an end! I do of course recognize that there will inevitably be some folks who would argue that I have handled this delicate topic too indelicately! Still, I appreciate you bearing with me, and do hope that perhaps it has after all offered some serious food for thought, and also perhaps introduced some incentive for a tad of light-heartedness in a very important on-going national conversation.